The acoustic version of Times Like These is basically an acoustic cover of the original song by the Foo Fighters, since the original used the entire band, and was played on the electric guitar. The acoustic version is played and sung by Dave Grohl. The reason learning this song is a great choice is that you'll be able to play along with the original track almost instantly. In our acoustic Times Like These guitar lesson, you'll learn all of the parts you'll need to play along with the actual song, and even sing along to it if you are into singing. The song is fairly simple to learn, as it uses basic chords, as well as some variations of those chords, and requires only 2 strumming patterns. 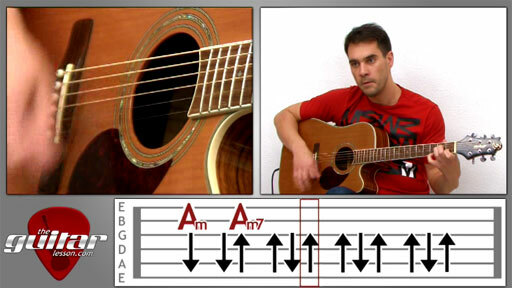 We'll start the tutorial by learning the chords you'll need to play the song. Once you are familiar with the chords to Times Like These, we'll learn the intro, followed by the verse, and finally the chorus. You'll want to note that the chorus is exactly the same as the last line of verse, so basically you won't have to learn anything new there. You'll also learn 2 variations to the bridge, one where you strum chords, and one where you play a short solo riff. You can decide which one you play. Through learning to play this acoustic version of Times Like These, you'll improve your strumming technique, and also your sense of rhythm, which is useful for all guitarists. Make sure you download the supplied tabs as well, since it includes the lyrics and the exact chord progressions you'll need to play along to the song! (a great album by the way!). It was used in several TV shows, movies, and on the political scene as well by George W Bush during his 2004 re-election. Sorry, but you've reached a premium content area. The download of the Times Like These tablature file is only available to premium members. Sorry, the same goes for the backing track. To download the backing track to Times Like These, please log in and revisit this page.